Paul Dixon. Picture: Michael Gillen. 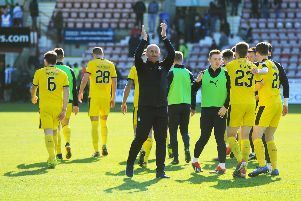 Falkirk’s new raft of signings have settled well, and Paul Dixon thinks things can only get better over the next fortnight of training. The Bairns are without a game this weekend after being knocked out of the William Hill Scottish Cup by Stenhousemuir in November. Dixon is unbeaten as a Bairn. Picture: Michael Gillen. While the Warriors head for Aberdeen, Falkirk will spend their fortnight free of competitive action working hard in training to further gel as a squad. Togetherness hasn’t been too difficult to foster, Ray McKinnon says and one of his most experienced men, and former charges, reckons the week working together will benefit the Bairns. Dixon told The Falkirk Herald: “We will get on the training ground this couple of weeks and try to get used to each other. It will just be fine tuning of how we want to play and what we need to do. Paul Dixon and Craig Moore. Picture: Michael Gillen. “I know the manager very well for my time at Dundee United and enjoyed working with him and think he is very good manager. He expects a lot from the boys which is the way it should be and hopefully in the weeks to come we will start to show how good a team we are. In glimpses on Saturday we showed that when we had the ball down on the ground we could play some good stuff. “Saturday was definitely a battle and very tight. It is a point from a losing position and I think that from speaking to the boys, earlier in the season it would have been a defeat for us. Dixon’s good impressions of the new players extends further than just first impressions. He trained with the Bairns after leaving Grimsby and turned out for the under-20s as a trialist so has a guage of where the side is at. He added: “There’s definitely an improvement in this squad. There were good players already there but for whatever reason they were still in a position that they were in. “I played with a couple of them, Paul Paton most of all – he’s a very good player. I know Joe McKee from playing against him and know how good a player he is. Falkirk’s next match is a home league match with Inverness Caley on January 26. Click here for early match preview stats.